Manchester City boss Pep Guardiola reiterated his belief his side will not go through the Premier League season unbeaten after their 18-game top-flight winning run was ended by a goalless draw at Crystal Palace. City conceded an injury-time penalty but goalkeeper Ederson saved from Luka Milivojevic, prompting Match of the Day host Gary Lineker to say Guardiola's side have an "air of invincibility about them". The draw preserves their unbeaten record in the league this season and takes them 14 points clear at the top - the biggest gap between the leaders and the chasing pack at this stage of the season in top-flight history. Arsene Wenger's Arsenal went through the 2003-04 Premier League season unbeaten, but Guardiola thinks City will not match that feat. "I am not thinking to be unbeaten," said Guardiola. "That is not going to happen. "Maybe Arsene is worried about that but I tell him many times that 2004 run is for him. Today is completely different to 2004. "There are now more strong teams, a lot of competitions, a lot of games." Guardiola left Selhurst Park with two injury concerns - striker Gabriel Jesus leaving the field in tears in the first half, and playmaker Kevin de Bruyne taken off on a stretcher after a heavy tackle from Jason Puncheon in the final minute. It leaves City with only one fit senior striker in Sergio Aguero, who came on for Jesus. Palace were rewarded as their defensive grit and off-the-ball energy shone through in an enthralling contest. The question, after they pressed so ferociously in the first half, was whether they were fit enough in the midst of the congested Christmas fixture list to keep it up. But they did just that, with midfielder Milivojevic covering more ground than anyone on the pitch (12.69 km), though that will be of little consolation after his spot-kick - given when Raheem Sterling fouled Wilfried Zaha in the box in the 92nd minute - was saved. The point means the Eagles start the new year outside of the bottom three, a point above West Ham in 18th - symbolic for a club that suffered seven straight defeats without scoring during their miserable start to the season. They also secured only their second home clean sheet in the league all season, against a team that has scored 102 goals in 2017. The downside to playing their energetic part in such an eventful contest was a first-half injury to centre-back Scott Dann, with boss Roy Hodgson already light on defenders in Mamadou Sakho's absence because of a calf problem. But they can take heart from creating other opportunities to win aside from the penalty - full-back Patrick van Aanholt testing Ederson in the first half and Andros Townsend wasting a gilt-edged chance to convert on 78 minutes. With Yohan Cabaye playing further forward than he did in their defeat by Arsenal, Palace had a courage with the ball to match their resilience off it. "I'm very proud of the team's performance," said Hodgson. "I know how difficult it is to play a team of Manchester City's quality. "Before the game we would have been jumping through hoops at having claimed a point, then you get a penalty late in the game, so there is an element of sadness at a chance missed. "But I've said to the players: 'Continue that level of performance week after week and we've got a good chance of staying in the league.'" Not winning their 19th consecutive league game is hardly evidence of the wheels coming off City's title charge, but there were signs that could be problematic in south London. Their ninth game in December saw more onus on the considerable creativity of De Bruyne in David Silva's continued absence. But the Belgian's set-pieces were off colour - only one of six deliveries was dangerous, and his passing accuracy (80%) was less than any other starting City player. Now Guardiola may have to cope without him after that late withdrawal, although he appeared able to walk alongside club physios after being carried off. Leroy Sane could step up to fill the gap in the coming weeks, but he struggled too. The 21-year-old won only half of his 14 duels, and was often second best to Palace defender Timothy Fosu-Mensah. He was meekly dispossessed by the on-loan Manchester United man in the first half, and berated by De Bruyne over the timing of another run. Then he was booked for kicking the ball away in frustration. It remains to be seen if Guardiola moves to bolster his attack by prising Alexis Sanchez from Arsenal in January, however the City boss said in his post-match news conference that he expects the forward to stay with the Gunners. "He is a player for Arsenal and I think he is going to stay there," he said. "In two days we have another game after that we have meetings. My feeling now is Alexis is an Arsenal player." Kyle Walker rarely let Palace's in-form Wilfried Zaha get the better of him, and made more interceptions (three), gained more possessions (13) and sprinted faster (34.69 km/h) than any other City player. This was City's first away goalless draw in the Premier League since March 2016 against Norwich City, ending a run of 34 matches in which at least one goal was scored. Only two teams have won more Premier League points in a calendar year than City in 2017 (98) - Man Utd in 1993 (102) and Chelsea in 2005 (101). Palace have only lost one of their past 10 Premier League games (W3 D6), having lost 13 of their 16 before this run. Hodgson has now failed to see his side score in his past five Premier League matches against Man City (D2 L3), a goalless run that stands at 465 minutes. This was Palace's fourth clean sheet in their past eight Premier League games, as many as they had managed in their 25 matches prior to this. City goalkeepers have saved 10 of the past 17 penalties they've faced in all competitions, with four different goalkeepers saving those 10 (Joe Hart, Claudio Bravo, Willy Caballero and Ederson). 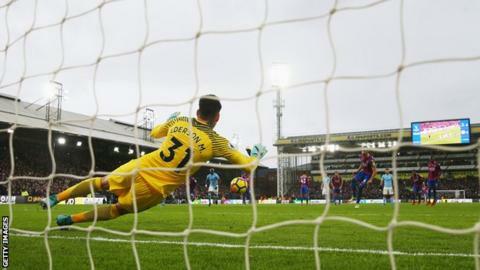 Wayne Hennessey was the first Palace goalkeeper since Nigel Martyn in May 1993 to keep a Premier League clean sheet against City. Palace have missed five penalties since the start of last season, two more than any other Premier League side. Sterling is the only Premier League player to have both won and conceded a penalty this season. Crystal Palace travel to St Mary's Stadium to face Southampton on 2 January (19:45 GMT), while Manchester City host Watford on the same evening (20:00 GMT). Match ends, Crystal Palace 0, Manchester City 0. Second Half ends, Crystal Palace 0, Manchester City 0. Attempt missed. Christian Benteke (Crystal Palace) header from the centre of the box misses to the left. Assisted by Andros Townsend with a cross following a corner. Corner, Crystal Palace. Conceded by Danilo. Kevin De Bruyne went off injured after Manchester City had used all subs. Substitution, Crystal Palace. Lee Chung-yong replaces Jason Puncheon because of an injury. Delay in match Jason Puncheon (Crystal Palace) because of an injury. Penalty saved! Luka Milivojevic (Crystal Palace) fails to capitalise on this great opportunity, right footed shot saved in the bottom left corner. Penalty conceded by Raheem Sterling (Manchester City) after a foul in the penalty area. Offside, Manchester City. Kyle Walker tries a through ball, but Raheem Sterling is caught offside. Substitution, Manchester City. Yaya Touré replaces Bernardo Silva. Attempt blocked. Kevin De Bruyne (Manchester City) right footed shot from the centre of the box is blocked. Assisted by Kyle Walker. Attempt missed. James Tomkins (Crystal Palace) header from the centre of the box misses to the left. Assisted by Andros Townsend with a cross following a set piece situation. Attempt missed. Andros Townsend (Crystal Palace) left footed shot from the centre of the box is high and wide to the right. Assisted by Wilfried Zaha. Attempt blocked. Jason Puncheon (Crystal Palace) right footed shot from outside the box is blocked. Assisted by Christian Benteke. Danilo (Manchester City) wins a free kick on the left wing. Substitution, Crystal Palace. Jason Puncheon replaces Yohan Cabaye. Offside, Crystal Palace. Timothy Fosu-Mensah tries a through ball, but Luka Milivojevic is caught offside. Corner, Crystal Palace. Conceded by Nicolás Otamendi. Who tops the 2017 Premier League table?